It’s the inevitable time of year when I am caught between two worlds, mentally and urban homestead-wise. One is the enjoyment of jumping into the river on scorching days, the sweating in a hot kitchen over a batch of honey-preserved apricots, the mostly living in underwear, thanks to our historic (read “old” and “air-conditioning-free”) home. The other is, for some unknown and unstoppable reason, the anticipation of butternut squash soup and cinnamon everything and then Christmas, for crying out loud. I always have an August spasm of holiday anticipation that catches me off-guard and attempts to reset the ol’ internal calendar. 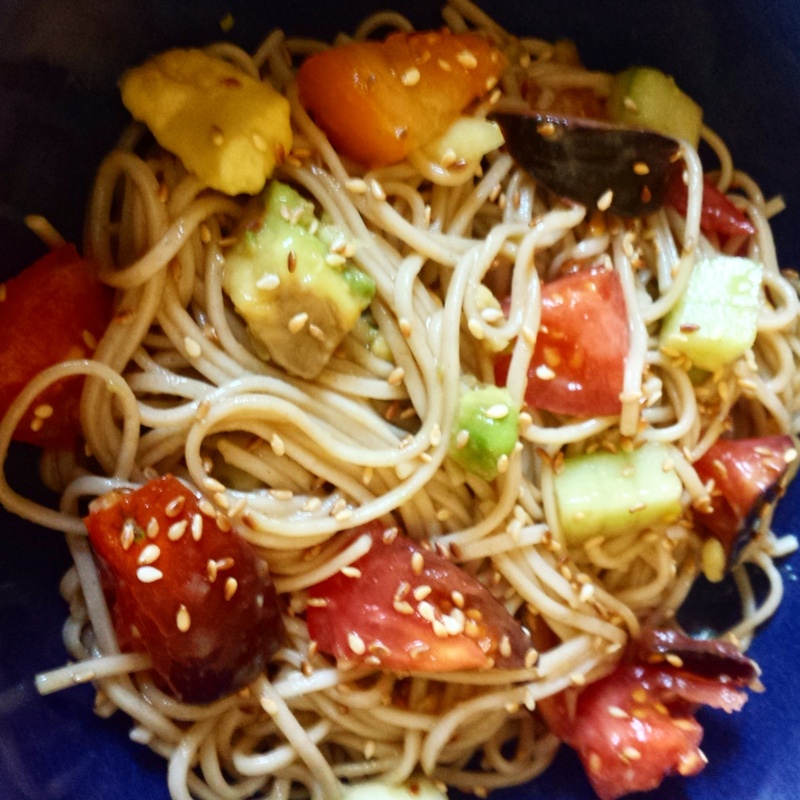 This cold, noodle salad is my attempt to live in the moment. It’s a joy of a meal, with its summer vegetables and toasted sesame seeds and fresh garlic. It’s everything you need on a warm day, and while I adhere to a lifestyle of mindful omnivorous eating, the recipe can work for you whether you subscribe to vegan or gluten-free or paleo values. It’s a vegan recipe on its own, but just make zucchini noodles if you’re grain-free, use buckwheat soba if you don’t eat gluten, or top each portion with a fried egg, if you’d like some protein. It’s perfect alongside cold sake. Cook the noodles according to the package directions, usually four minutes. Rinse them until they’re cold, drain them, use your hands to toss them in 1 T sesame oil, and stick them in the fridge. If you’ve not already, dice and mince the veggies. Mix in all the veggies, along with the rest of the ingredients. Start small on the soy sauce. May your week be filled with the perfect amount of sun and fresh produce! 10 Aug	This entry was published on August 10, 2015 at 10:07 am. It’s filed under Collection and tagged cucumbers, DIY, heirloom tomatoes, japanese, japanese soba salad, organic gardening, organic vegetables, portland organic gardening, salad, sesame seeds, soba, soba noodle salad, tomato and cucumber salad, tomato salad, urban farming, urban garden, vegan soba. Bookmark the permalink. Follow any comments here with the RSS feed for this post. Older: Lafayette. Charleston. Aurora. Etc.